Walking Corpse Syndrome is a neurological disorder. It is characterized by people who deny their very existence. The people affected by this syndrome behave weirdly as their psychological stability is disturbed. They opine that they are dead, their body undergoes putrefaction and their flesh smells rotten. Some people consider themselves to be devoid of their vital organs or their heart does not beat. This syndrome was formulated by a French neurologist by name Jules Cotard. This syndrome is also named after him as Cotard’s disease. The people affected by this syndrome have different tastes, preferences and strange attitude towards life. A specific cause cannot be found for this syndrome but this is characterized by excessive stress, improper mental conditions fear and over anxiety. On the contrary some people experience immortality. This syndrome normally affects old people but now it affects even the younger generations also. Women are mostly affected by this syndrome than men. People have sometimes starved themselves to death thinking that they are not the body but a revenant or a zombie that has come back to life. It has been speculated that this syndrome is the result of the bruises at the front part and the temporal regions of the skull. But there is no exact reason for this syndrome. This syndrome is more common to people with depression. It affects people with neurological disorders such as dementia, bipolar disorder and parkinson’s disease. It is also characterized by other diseases such as tumors in brain , neural atrophy, brain seizure, neurological disorder, neural and brain injury and migraine. Sometimes they may be the result of any side effects of any illegal medications and kidney problems. People suffering from kidney problems take in medicines that adversely gives him this delusion. The symptoms of this syndrome are that they are deluded by the thought that they are dead and they can indeed smell rotten flesh. Some indeed say that they get the smell of putrefaction and it is true to some extent ! Paralysis also sets into some of the people. These people do not even recognise their face in the mirrors and have suicidal tendency. They even deny their existence and harm themselves. They also neglect their own personal hygiene and have their own strange distorted view of the world. These symptoms also include guiltiness, insensitivity to pain and depression. In this stage the person begins to get affected by the disease. They begin to experience worry, anxiety and stress and excess fear despite being medicated. The person may be medicated at this stage but it is upto the person because it is impossible for the person to respond to the treatment. If the person responds well then there are good chances for any person to be cured from this affliction. It is only at this stage that the people begin to experience the real effects of the syndrome. The state of being delusional now creeps into the minds of the people and they begin to show signs of negativism. They start to deny their very existence and consider themselves either immortal or dead. At this stage the people have to be treated seriously and they must never be left alone because they may harm themselves or commit suicide. These people should not be however left in a secluded place. People, at this stage, experience extreme paranoia and depression that very well adversely harms them apart from their little apprehension that they know about them. They become jinxed and very obsessed with their own cataclysmic thoughts. People at this stage are beyond the scope of treatments but now many modern medicines have evolved to cure this disease. It involves both psychological and external treatments. Once the diagnosis of this syndrome is complete, the treatments follow. They include no invasive procedures as it is a problem of the mind. If the problem is a small one like family issues, tension, work stress, worries, anxieties and fears, private counselling is provided to the patients to relieve them off the situation. In case of slight serious factors the anti depressants, sleep tablets and mood stabilizing medicines are administered to the patients. They help in diverting the focus of the patient’s mind from their object of concern to another matter to relieve their mind. To those seriously affected by this syndrome, Electroconvulsive Therapy is used. It involves placing the electrodes at the two points of their foreheads and giving them small impulses of electric current. In reality there is no treatment for this treatment but based on the patient’s opinion of life, their likes and dislikes and their motivation in life doctors prescribe some drugs. Some doctors also suggest yoga and other recreational activities. This helps them to get out of their normal life and to explore their vast scopes of enjoying their life. The family members of these people too should be careful in treating these people with utmost care. They need love and affection from their family members. Although it is difficult to live with a patient who thinks he is dead, the family members must feel free to cope with him and make him feel special. Some patients respond positively to the treatments given but some do not respond properly. They die either of starvation or kill themselves. 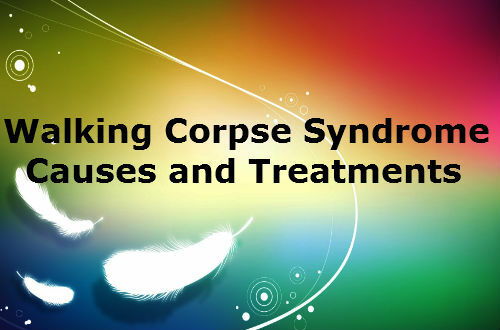 There are many interesting cases recorded about the mysterious cases of the patients of the Walking Corpse Syndrome. These cases intrigue one as they are weird and funny at times too. A woman from the Philippines once registered a case that she is dead and she also could smell her rotting flesh. She also alleged that the paramedics were trying to burn her house down. She became victim to this syndrome due to hopelessness, living alone, tiredness and feeling of dizziness associated with loss of appetite. She was brought back to normal by meditation. A man was transferred from Edinburgh to South Africa. He was suffering from an ailment and was being hospitalized. He was then affected by this trauma. He said that he was dead and was transported to hell. He alleged that he died due to HIV aids and that he alleged that the one who accompanied him to the hospital was not his mother but was her spirit. There are several other cases that go around the world which is equal in its effect. Though considered a very rare syndrome this has taken the world by surprise and has started to affect all the people worldwide.